Cholecystectomy is the surgical removal of the gallbladder, the small saclike organ located near the liver in the upper right side of the abdomen. It is attached to the main duct that carries bile from the liver into the intestine. Bile helps your body to break down and absorb fats. The gallbladder temporarily stores bile from the liver. When you eat, the gallbladder contracts, and squeezes extra bile into the intestine to aid digestion. Traditional surgery – The surgeon cuts open the abdomen and removes the gallbladder through an incision that is about 6 inches long. The abdomen is then stitched closed again. 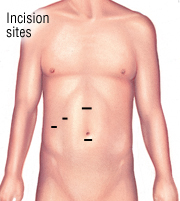 Laparoscopic surgery – The surgeon makes four small (less than an inch) incisions for a laparoscope and instruments. A laparoscope is a tube-like instrument with a camera for viewing, and with it the surgeon can to guide the surgical instruments to remove the gallbladder. 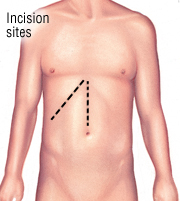 The gallbladder is cut away from the liver and the bile duct and removed through one of the small incisions. Surgeons remove about 500,000 gallbladders in the United States each year. About 90% of the time, laparoscopic surgery is used because it requires a shorter hospital stay, is less painful, and has a shorter recovery time compared to traditional surgery. In the remaining 10%, traditional surgery is used because the person has significant abdominal scarring from prior surgery, severe inflammation, unusual anatomy, or other factors that make surgery with a laparoscope very difficult and riskier.